Our Lady's School has been dedicated to the spiritual and academic development of children for nearly 100 years. Two separate Catholic schools merged in 1973 to become what we now call Our Lady's School. Our Lady of Angel's School and Our Lady of Guadalupe School each have a rich history of academic excellence and achievement in their respective communities. Today, they work together to form a pre-school through eighth-grade education system that prepares children to meet the challenges of life. Our Lady of Angel's was built under the leadership of the Sisters of St. Joseph of Carondelet. The school was erected in 1912 to serve the Sherman Heights and Golden Hills communities. Our current site was later built in 1922 to serve first through eighth grade students. In 1945, the Sisters of St. Francis of Philadelphia established Our Lady of Guadalupe School to meet the growing demand for quality Catholic education in the Logan Heights community. A combination of civil unrest and rezoning laws led to a dramatic decrease in enrollment in 1970. In the face of financial difficulties and possible closure, the two schools merged in 1973. Today, Our Lady's School stands as the oldest Catholic elementary school in San Diego County. The Fr Brown Campus, at Our Lady of Guadalupe parish, accommodates kindergarten through third grade. The North Campus, at Our Lady of Angels parish, accommodates our pre-school and grades fourth through eighth. 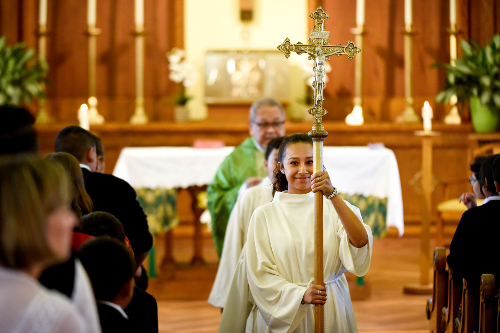 In an effort to nourish both the academic and spiritual needs of our students, Our Lady's School has sought the guidance of the Jesuit Order through the supporting parish of Our Lady of Guadalupe. We strive to evoke St. Ignatius of Loyola's standards of education by promoting justice, love, service and spirituality in all that we teach and do.